Both beetroots and leaves are edible and highly nutritious. Beets are a source of folate, potassium, fiber, magnesium, vitamin C, iron, and vitamin B6. They also contain phytonutrients called betalains, which have anti-inflammatory and antioxidant properties, so eating beets may help to protect against cancer, cardiovascular disease, and many other diseases. When can I plant beets? Beets will germinate at temperatures ranging from 40-80 degrees Fahrenheit/4-27 Celsius. They’ll sprout more quickly at the higher end of the temperature range, but once they’re underway, they grow best during cooler spring and fall temperatures. If you’re starting your beets indoors, begin your spring crop 3-5 weeks before the last frost date and transplant the seedlings outside on the last frost date. If you’re sowing beets directly outdoors, plant 2-4 weeks before the last frost date. For a fall crop, direct sow 6-10 weeks before the first anticipated frost date. If your climate is mild, you can continue harvesting beets into the winter. In milder climates, you can start sowing beets in March, though providing some cold protection, such as a polytunnel or mini hoop tunnel, is recommended. For fall crops, adding mulch and/or a polytunnel or mini hoop tunnel just before the first hard frost can help to extend the harvest. Succession sow every 2-4 weeks if you’d like a continuous supply of tender young beets. Note: Starting beets indoors doesn’t provide much of an advantage. They don’t like being transplanted, so their growth may slow down for a bit afterwards. Also, transplanting creates a risk of vernalization, which means that large temperature shifts trick the plants into thinking they’ve gone through a year of seasons and are in their second year of growth, which causes them to bolt early (produce flowers and seeds). Once beet plants have bolted, they won’t produce usable roots. If you want to start your beet plants indoors, grow them in individual cell packs or soil blocks to minimize root disturbance when transplanting, and don’t put them out until temperatures have warmed up to reduce the risk of vernalization. You’ll also need to harden the seedlings off before transplanting, which means putting them outdoors for 2 hours on day 1, a hour or two longer on day 2, and so on until they adapt sufficiently to move to their permanent home. How long will beet seeds take to sprout? Germination can take days or weeks, depending on the temperature. In the ideal germination range of 70-80 degrees Fahrenheit/21-27 Celsius, they will sprout in around 5 days, whereas in temperatures as low as 40 Fahrenheit/4 Celsius, they may take up to a month and a half, if they germinate at all. How far apart should I space beet seeds? Plant beet seeds 1.5-2 inches apart, and then thin to 3 inches for small roots, 4 inches for regular-sized roots, and 5 inches if you’d like large roots or your soil is poor quality. You can grow approximately 12 beets per square foot, or 12 in a 16-inch container. Thinning beets to the appropriate spacing is very important. If you don’t do this, you’ll end up with stunted, underdeveloped roots and your plants will be at risk for disease. You can eat beet thinnings in salads. What type of soil do beets need? Beets grow best in loose, sandy soils that are well-drained and very fertile. When preparing the soil, remove rocks and other debris that could cause beetroots to fork and dig a few inches of compost into the top 6-8 inches of soil. If you use manure rather than compost, add it in the fall so that it’s well-aged at planting time, because fresh manure will also cause beet roots to fork. If your soil is nutrient-poor, mix in a complete fertilizer before planting as well. Can I grow beets in a container? Yes, if the soil is sufficiently nutrient-rich and you water regularly (container soil dries out faster than soil in the ground). You’ll need a container depth of at least 6 inches for round beets (and preferably more); some sources recommend a minimum depth of 12 inches. If you’re growing cylindrical beet varieties, you’ll need even deeper containers. The container should also be wide enough that you can thin beets to at least 4-inch spacing. Can I grow beets in the shade? 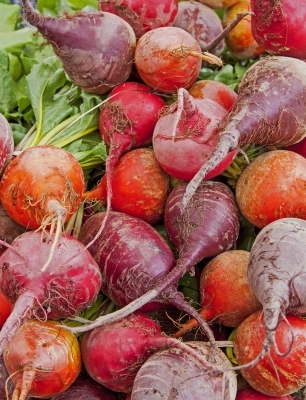 Beets do best in full sun, particularly fall and winter crops. However, if you live in a hot climate, your beet plants should do well in light shade (only a few hours of sun per day, with shade during the hottest part of the day, or dappled sun, in which tree branches cause alternating small patches of sun and shade). What ongoing care do beets need? Beet seeds are actually seed clusters, so you’ll probably get several plants per seed. Use scissors or pinch out all but the strongest seedling in each cluster once the seedlings are 2-4 inches tall. Don’t pull them out, as you’ll damage the roots of the remaining seedlings. Weed regularly, as beets don’t compete well with weeds. It’s best to do this by hand because the shoulders and shallow roots of beets can be damaged easily by tools. Water regularly to keep the soil moist, but not waterlogged. Beets grown in very soggy soil tend to focus more on leaf production than root production. On the other hand, beets grown in dry soil can develop tough, woody roots, and they may crack or bolt early (put their energy into flower and seed production rather than root growth). Once temperatures have reached around 60 degrees Fahrenheit/16 Celsius, apply a mulch to conserve moisture, suppress weeds, and keep the soil cool. Should I fertilize my beet plants? Beets require plenty of nourishment, but it’s important to get the balance right. Too much nitrogen will cause beet plants to focus on leaf growth at the expense of root growth. Like other root crops, they do best with some added potassium and phosphorus. You can add a kelp fertilizer every few weeks or ask for fertilizer recommendations from a local garden center, but avoid high-nitrogen fertilizers. How long do beets take to grow? Days to harvest can be quite variable with beets, ranging from around 50 to 100, depending on the variety, though most will mature in 50-70 days. When can I harvest beets? You can harvest beets whenever the roots are large enough to be worth using, typically after around 50-60 days of growth, when they reach 1-2 inches in diameter. If you harvest beets while they’re still young, they’ll be more tender, but less sweet. 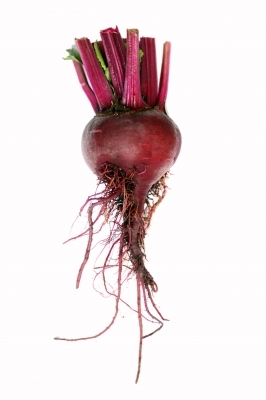 More mature beets are sweeter, but more fibrous, and overly mature roots are tough and woody. Be careful not to damage the roots when harvesting. If you break the outer skin, they’ll decay quickly. If you’re harvesting for salad greens rather than roots, it’s better to pick them while the greens are still young and tender, before the roots have matured. Or, for the best of both, take a few leaves from the outside of each cluster before the roots mature, leaving the center leaves intact so that your beetroots will continue growing to maturity. Why didn’t my beet plants produce large roots? There are a number of reasons why beet plants won’t produce good roots. If you don’t thin your plants to the appropriate spacing or weed the area regularly, too much competition will prevent root development, and high temperatures (above 75 Fahrenheit/24 Celsius) can cause roots to be small, tough, and bitter. Nutrient-poor soil can also lead to underdeveloped roots. The wrong nutrient balance can cause this problem as well, because too much nitrogen encourages the plants to produce big leaves rather than focusing on root development. Why did my beets crack or split? The most common cause of cracking is inconsistent watering. Keep the soil consistently moist to prevent this problem. Beet shoulders may also crack when they rise above the soil and are exposed to the elements. Piling soil up around the shoulders or mulching reduces the risk that beet shoulders will crack or become woody. Forking is not actually a split, but rather, the bottom of the beetroot growing into two or more separate sections (typically, the root looks like a pair of legs). This usually occurs when the plant’s growth is blocked by a rock or other obstacle, but fresh manure and careless transplanting can also cause this problem. How do I deal with pests on beets? Beets aren’t usually bothered too much by pests. Aphids may attack the leaves, but they can be sprayed off with a blast from the hose. If other pests such as caterpillars, flea beetles, or leaf miners are eating your beet leaves, you can protect the plants with row covers. Rabbits also like to eat beet greens. If rabbits are attacking your beets, you may need to put up a fence. Why are there spots on my beet leaves? Cercospora beticola is a fungal disease that attacks plants such as beet, chard, and spinach. The spots are round with tan or off-white centers and dark red borders, and the roots of heavily infected plants are stunted. The problem can usually be prevented by rotating crops each year, thinning and weeding sufficiently to allow for good air circulation, and growing the plants in fertile soil, as poor nutrition and high humidity can aggravate the problem. How do I store beets, and how long will they keep? Cut the leaves off an inch or two above the crown of the beet. Leave the roots intact and brush off the soil, but don’t wash beets until you’re ready to use them. You can store beets in a plastic bag in the fridge for a few weeks, though with tender, young roots, it’s best to eat them as soon as possible after harvesting. Beet greens can be stored in a plastic bag in the fridge for 3-5 days, but are also best eaten soon after harvesting. For longer storage, you can put beetroots in a box full of clean sawdust, peat moss, or damp sand in a cool cellar, unheated basement, shed, or garage where temperatures range from 32-40 Fahrenheit/0-4 Celsius. Don’t pack them in too tightly; store them in layers to allow for air circulation. In the right conditions, they will keep for a few months. For even longer storage, you can freeze beets. Cook them until tender, peel them, cut them into cubes or slices, add the pieces to a freezer bag or airtight container, and store for 12-18 months in the freezer. Unless you live in a very cold climate, you can also leave beets in the ground over the winter and pull them up as needed. They’ll continue to grow slowly in mild climates, but stop growing altogether in cooler climates. If it’s cold enough for the ground to freeze, add a thick mulch to prevent freezing. Additional cold protection, such as a mini hoop tunnel or polytunnel, can also be used to prevent freezing. How do I save beet seeds? Beets produce seeds in their second year of growth, so in mild climates, just leave your beet plants in the ground with some protective mulch throughout the winter. Colder climates may kill beets over the winter, so if you live in a cold place, you may need to harvest the roots, store them in an unheated basement, shed, cellar, or garage in a box filled with damp, clean sand, and replant the best ones outdoors in the spring. Beets will cross-pollinate with other beet varieties, and with chard and spinach, so these plants need to be isolated from one another by at least 1/2 a mile/800 meters if they’ll be flowering at the same time. Gather seeds from more than one beet plant to preserve genetic diversity. Recommendations for the minimum number of plants range from 5-20+. When most of the glomerules (clusters of seeds) have formed and turned brown, cut the stalks and strip off the glomerules by hand (wear gloves to do this). You can store the stalks indoors to let the last few seed clusters ripen and dry out so that you can collect them as well. Use a sieve or screen to remove debris and dust from the glomerules and store them in an airtight container in a cool, dark place. If stored properly, beet seeds should keep for 4-6 years. You don’t actually need to peel beets, so this is down to personal preference. Some people just wash their beets before preparing, whereas others like to peel them. If you want to peel your beets, it’s much easier to do this after cooking them as well. If you prefer to skip peeling to save time, keep in mind that skins are more tender on baby beets than full-sized beets. How do I prepare beets? Beets are often eaten raw in salads (typically grated or sliced very thin) or cooked with various herbs and spices as side dishes. They can be added to soups, roasted, or pickled, and beet leaves can be steamed or added raw to salads as well. See Chowhound for a basic roasted beets recipe with olive oil, salt, and pepper. You can find great beet recipes for main courses, side dishes, appetizers, snacks, drinks, and desserts on the Food Network’s 25 Recipes You Simply Can’t Beet and Eating Well’s Our Best Beet Recipes. For more vegetable and herb gardening articles, see the main Gardening page. For food articles and recipes, see the main Food and Nutrition page. Edwards Forkner, L. (2012). The Timber Press Guide to Vegetable Gardening in the Pacific Northwest. Portland, OR: Timber Press. Halsall, L. (2012). Small Plot Big Harvest: A Step-by-Step Guide to Growing Fruits & Vegetables in Small Spaces. New York, NY: DK Publishing Special Markets. Herriot, C. (2010). The Zero-Mile Diet: A year-Round Guide to Growing Organic Food. Madeira Park, BC: Harbour Publishing. Jabbour, N. (2012). The Year-Round Vegetable Gardener. North Adams, MA: Storey Publishing. McGee, R. M. N., & Stuckey, M. (2002). McGee and Stuckey’s the Bountiful Container. New York, NY: Workman Publishing. Pleasant, B. (2012). All About Growing Beets. Mother Earth News. The George Mateljan Foundation. (2015). Beets. The World’s Healthiest Foods. StillTasty.com. (2016). Food Storage – How Long Can You Keep Beets – Fresh, Raw.